Sequel announced? See the below for the trailer for the follow up to one of the best games of 2009. Before the dust settled on the beginning of this year's Video Game Awards on Spike, the first surprise announcement was the revelation that Batman: Arkham Asylum would get a sequel. Batman: Arkham Asylum 2 -- which is what we'll call it until an official title is revealed -- presumably continues where the original critically acclaimed Rocksteady title left off, and was revealed via diabolical plot from Batman's Nemesis The Joker. Attempting to gas those in attendance, Mark Hamill's threatening vocals reverberated throughout the audience revealing a sequel people "didn't expect." After smashing through sales charts and the assumptions that all licensed titles are crap, we expected nothing less. Take that, Joker! I did a little wee when I saw this. I just hope they aren't going to rush development. Is Rocksteady's superb Batman video game series already reaching the point of Robin? So says a listing for Batman: Arkham Asylum II at the occasionally factual Internet Movie Database. That could be bad news... or it could be good. The bad depends on your tastes, whether you consider the lone wolf Batman to be superior to the dynamic duo version. The positive perspective could be the theoretical addition of cooperative play in the sequel to Batman: Arkham Asylum, something we've just been groomed to expect from our current and future releases. Regardless of your feelings, the IMDB listing for the game credits Vincent Martella with Robin voice acting duties. He plays Robin in the Batman: Under the Red Hood animated feature as well as Hope in the newly released Final Fantasy XIII. He's listed alongside Bruce Greenwood as the voice of Two-Face, also appearing in Batman: Under the Red Hood. Perhaps the IMDB entry editing powers that be simply confused the two projects, but we've contacted Warner Bros. reps to try to clear this up. Update: Warner Bros. reps respond, saying "To our knowledge, what you asked about is inaccurate information. We are not yet discussing details for the sequel." We'd prefer a hard and fast "No!" or "Yeah, he's totally in it." but that's about as clear as WB is making things right now. In the right setting, Robin can be a very interesting character. Of course Nightwing is far more interesting, with that rocky relationship between him and Batman. And with the beautifully dark and mysterious tone of the first Arkham Asylum, I have no doubt that if they do add Robin, it will be a variation of Robin I'll like. They may even be referencing Robin as a flashback character that gives background info for Nightwing. Nightwing may actually be the character that appears in current-day Gotham. One of Batman: Arkham Asylum's cool tricks was the Detective Mode, which let you see enemies through walls and obstacles plus areas of interest, such as ventilation shafts and grapple hooks. It was a smart idea that was well implemented. So why are we asking for less Detective Mode? Because it was so good and so useful, it was actually easier to play with it switched on by default. Detective Mode was argubaly a little too good for its own good and sometimes, you'd have to make a point of switching it off just to take in the stunning visuals. We're not sure how you'd tone it down without making it redundant but a better balance is needed. Arkham Asylum was packed full of clues to the other villains Batman has had to face during his time and uncovering them was half the fun - the icy cell of Mr Freeze, the Selina Kyle whip hinting at Catwoman, Clayface locked up but impersonating the mayor, all cool turns in the asylum. Why not let them run riot in the sequel? We'd love to see the Joker return but as long as new villains were brought in alongside him - Two-Face and Ra's al Ghul would be awesome - then we're happy. Which goes against the name, of course. But Batman has now done Arkham Asylum. Batman covers every inch of it throughout the course of Arkham Aslyum, backtracking as he picks up new items and as Poison Ivy's mutated plants transform the place, so it's not even ripe for a fresh look-at-Arkham-Asylum-now-it's-ruined slant. Even that's been done. So shift the action somewhere else. Maybe an opening section in the Arkham Asylum, to ensure the title of the game has relevance and it ties in with its predecessor, before the plot moves Batman elsewhere. As for where? Well, that's Rocksteady's job, not ours. We can't do everything for them. We've put it this low down the list because we're not even sure if we want to see it. 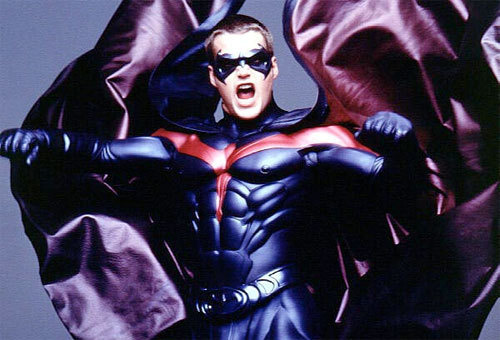 We're almost certain we don't want to see Robin in the game but the absence of Robin means Batman teaming up with Batgirl, which makes us think of Alicia Silverstone trying to pronounce compost. That's probably worse. Yet it's the next logical big step in the series and is a big enough step that it would justify the presence of a sequel. Plus, if nothing else, there would be so much moaning if it didn't make it in. That's the real reason we want to see it. The riddles were varied enough in the original Arkham Asylum, so as long as Rocksteady found new ways of spicing them up, there would be no complaints from this corner. More of a must is a need to introduce more types of enemies, as there wasn't that much variety to learn and figure out how to overcome. I have to disagree with this. I did use Detective Mode during 90% of my gameplay, but I don't think it took away from the game at all. If anything, it made me feel more like I was playing the role of Batman. The fact that you can turn Detective Mode on/off whenever you want, gave the game a realism and freedom that immersed me into the game. By limiting Batman's tech abilities, you're limiting Batman himself. That's just wrong. If Batman wants to see the world through Detective Mode, let him. i think it's the choice of the player, i barely used Detective mode. I loved the detective mode!!! was super awesome! The name should be changed now as I think your out and about in Gotham? Batman: Gotham City ... meh!